Save the edited video to the mobile device. As is known to all, iPhone comes with HD and 4K (for some models) camera which makes it shot videos in a very convenient and effective way . It is one of the best selfie tool. If you like the selfie and share selfie to Facebook, I think you may have experienced this situation that sometimes the pictures/videos show sideways after uploading to facebook though they play correctly on iPhone. This is because they are recorded in portrait mode you may have not noticed. So is there a way to rotate the photos and videos easily? Sure. In this article, I will introduce simple ways to rotate photos shot by iPhone in three ways. This is an easy and direct way. The first thing I would think of is iMovie and you can use it on iPhone 5C/5S/6/6 Plus/7/7 Plus/8/X/XS and more iPhones for free. It is an Apple supported video editor. If you just want to do basic video editing on iPhone, it is a useful and effective tool for you to have a try. Here are the steps to know how to rotate iPhone videos on iPhone with iMovie. 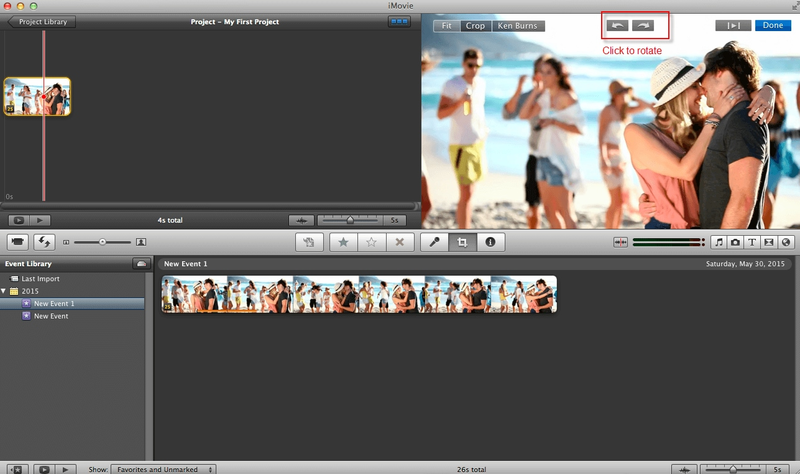 Step 1: Open iMovie first. Then import the video you want to rotate. Twist video image to the right or left in the viewer. Step 2: After you are satisfied with the orientation, you can export it. So esay, right? Note: After you rotate video, it may take a while to appear the effect in the viewer. However, it doesn't come with all kinds of iPhones for free. If you are an iPhone 4,4s,5 user, you have to pay for iMovie and I would not recommend. Here are the steps to rotate iPhone videos on iPhone. Besides iMvoie, you can search more tools to rotate video from App store. The two following free tools are recommended. Rotate video & Flip which is a free tool special for rotating and flip video. Vlogit which is another video editing app for iPhone that can do rotating. After downloading from app store, you can run the app from the iPhone and then you can follow the app screen wizard to rotate video easily. If you are a Mac computer user, you can import your iPhone video and then rotate video in iMovie easily. iMovie is a free editing tool which comes with Mac computers like Macbook air, Macbook pro. Check the steps below to know how to rotate iPhone video on Mac for free. Step 1: Launch the software iMovie and then click import to import the iPhone video. Step 2: Click 'crop' menu to open the crop window, you will find the rotate icon above. Step 3: You can click the rotate left or rotate right icon to rotate your iPhone video 90 degrees clockwise or anticlockwise. Step 4: Click share menu and then click 'export using quick time'. If you are a Windows PC user, I am afraid there is not a free iMovie app for Windows system and it is difficult to find a free tool to rotate iPhone video. The free movie maker comes from Windows ( Windows movie maker) doesn't support iPhone video format and the windows movie maker has also been discontinued on 2017. To rotate iPhone video in Windows PC, you need a third party video editing software such as Wondershare Filmora9, especially if you want to do a lot of other editing to your iPhone videos such as trim your video, add background music, apply video effect to enhance your iPhone videos. Having all kinds of powerful editing tools and brand new interface, Filmora9 has become a best tool for video amateurs. Would you want to download the 30 days free trial version to have a try now? To load your iPhone videos, you just need to connect your iPhone to your PC first, and then click the Import menu and choose Import from a camera or a phone option to enter the Import from Device window. From here, you need to choose the device first. Filmora9 also allows you to select all media in your iPhone with the Check All option in the left-lower window. The iPhone videos and images will be saved to the default location but you can change the saving location as well. Click OK and the media will be imported to the media library automatically, which is quite easy and time-saving. Select and place the iPhone video footage to the timeline, double click the video to open the Video panel. Go to Transform option, and drag the Rotate slider to rotate the video to any angle you like. Beside, you can also flip the video vertically or horzontailly. You can also drag the blue handle in the preview window to rotate. You can also right click the video in the timeline and then select quick rotation from Rotate 90 CW and Rotate 90 CCW. 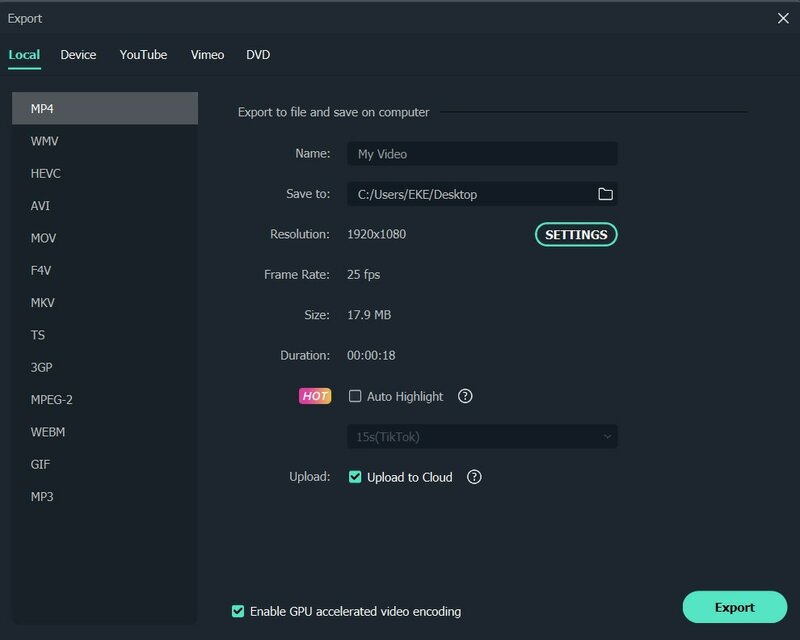 Wondershare Filmora9 offers the option to help you do most of the editing you want like trim/cut/flip video, add text effect/filter effect/overlay effect/music resource/transition. If you don't need to edit your videos, you can skip this step. After rotating your iPhone video, please click 'export' to save the change and then export it to a new video and you can share it to social media directly too if you do want to. You can save it in different formats or save to device (such as iPhone and Android phone) or share on YouTube and Vimeo directly. App for rotating while shooting like our ‘droid friends? Super easy and free for Mac user is MPEG Streamclip app. Awesome tutorial! I use this tool: http://www.videostudiopro.com/en/pages/rotate-video/ to edit and rotate videos on my PC, but I couldn't find a decent solution to do the same on my iPhone until I ran across your useful guide. So thank you very much for solving my problem.